Friday, Dec. 19th, 7:00 p.m. If you've seen them before -- you can see and enjoy them again in the presentation of Happy Holidays at the Jefferson Educational Society. The Four Grads and the Lake Erie Sound are thrilled to celebrate the holidays with the presentation of some of the season's favorite songs. They will be hitting all the right notes for the Holidays. Take a journey through the traditional holidays as the pure magic of the season will be reflected at the Jefferson on the evening of Friday, Dec. 19th, 2014, at 7 p.m. Salute the holidays with us -- YULE be glad you came. The Four Grads are Carl Hultman, Barbara Schwartz, Bob Seaman and Stan Bialomizy, singers/instrumentalists influenced by vocals of the Four Freshmen. The Lake Erie Sound is an acapella men's chorus in Erie under the direction of Peter Frank. 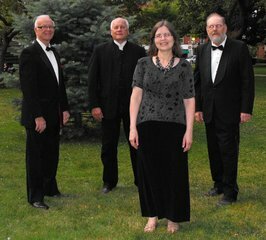 Go to www.lakeeriesound.org for more about this group. Call the Jefferson Educational Society at 459-8000 to reserve your free ticket. Jefferson is located at 3207 State St. in Erie, PA.